British scientists have created a hearing device that can help people, deaf in one ear. Its specific feature is that it is worn on the teeth. This device transmits sound vibrations from the sick to the healthy ear through the bones of the skull. It is attached to the upper jaw and after fixing becomes almost invisible. For the first time in the world to transmit sound to the auditory nerve is used not an air, but bones of the skull, which, by the way, are an excellent conductor of sound. This invention was done in proper time - currently 9 million of people suffer from total or partial loss of hearing in the USA. More than 2 million of people use hearing aids, although more than 6 million people need such devices. The new hearing aid may be useful to many hearing impaired. Tiny microphone that is placed behind the ear catches sound and transmits it wirelessly to the hearing device that is attached to the teeth, usually molars from the side of ill ear. Then device uses property of the skull bones to conduct sound - improved audio signal is transmitted to the inner ear where auditory nerve is located. In its turn it converts sound into electrical signal and send it to the brain. Patient does not need surgery. Taking into consideration the fact that damage to the inner ear can be treated only carrying out an operation, with this innovative invention surgical intervention is not required. Patients also do not need to produce medical procedures in the oral cavity, as this device is simple, removable and completely non-invasive. Practically invisible. The patient will not feel embarrassment when contacting with people, as is often occurs in the case when using conventional hearing aids. In addition, low prices for hearing aids make it affordable for all patients. It eases speech recognition in a noisy environment. Studies proved that in noisy environments patient recognizes conversational speech better up to 25%. It is comfortable. The device is made taking into account physiological characteristics and structure of the teeth of each patient. This allows patients to live without changing their regular habits. 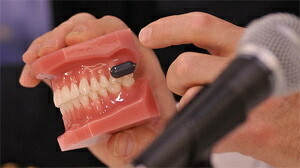 Prosthodontists in USA started to apply new type of dentures that improves hearing. To get more information make an appointment with prosthodontist to figure out if this option will be appropriate for you. However, experts from the Royal National Institute for Deaf People warn that this aid is suitable not for everyone – determinant factor will be the cause of the hearing loss and its degree. Contraindications are also specific inclination of molars and wearing dentures. But modern dental treatment will help you to solve all such problems and dentist will restore your hearing function.